I’m back to posting the stories behind the ‘Beyond Words’ author calendar, and I’m picking back up with Scott Westerfeld! But, as always, I’d be remiss if I didn’t remind you to grab a copy of the calendar; the proceeds go to charity, so it’s for a great cause! Scott’s was one of the images I saw from the beginning of this calendar. I wanted a magical tree growing all sorts of keys and a locked door on the trunk that leads to an infinite number of places. It’s got a bit of a steampunk vibe, something Scott also enjoyed, so it was a good fit for him from the start. I had to do this photo in stages. The first stage was shooting Scott in his pose, and I found a lovely weird tree in Central Park in NYC that completely captured the whimsical vibe I wanted. Getting ready for the shoot. Taken by Garth Nix. My friend Jeffrey prepping the tree for the shoot. Scott looking dapper. Taken by Garth Nix. Behind the scenes! Taken by Garth Nix. 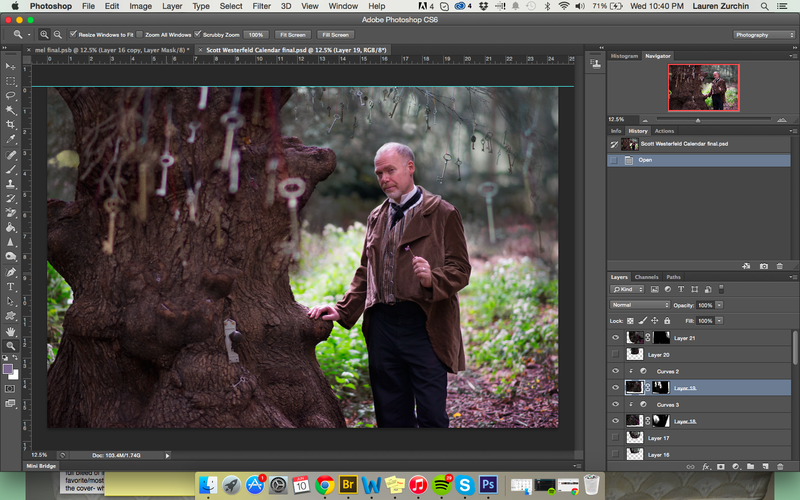 Next I shot stock of the keys which I later layered on top of his image to achieve the final look. This is one of many stock key images I shot. I wasn’t sure what would work until I was sitting down with Photoshop, so I just tried to cover all my bases in one go. From there it was just a matter of making sure all the pieces were put together correctly. The final product definitely carries the fun magic I love about this project. This was a really fun one to create. I’m going to be posting two blogs a week to make sure they’re all out before Christmas. Stay tuned for the next one, Melissa de la Cruz! And don’t forget to grab a copy of the calendar (remember, all proceeds go to charity!). Did you miss the previous calendar stories? Be sure to check out the creation of Robin Hobb’s, Leigh Bardugo’s, Tony DiTerlizzi’s, Kami Garcia’s and Garth Nix’s images!